Rainford Tennis Club are the first outdoor venue on Merseyside to achieve Tennis Clubmark in recognition of their good practice and quality delivery. The Club have been awarded the accreditation from the LTA for demonstrating excellence in their tennis programme, club management, policies and procedures and action planning. “We are delighted to have achieved Tennis Clubmark.” said secretary John Case. “We are looking forward to a very successful 2009 season and would like to thank everyone who has helped us achieve Tennis Clubmark"
"Achieving Tennis Clubmark shows to existing and new members that we are a safe and well-organised tennis venue.” added John. 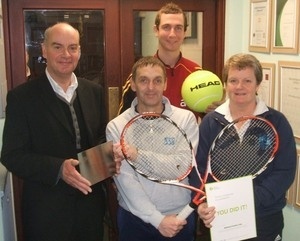 Our picture shows Head Coach, Steve Vincent, being presented with the Tennis Clubmark plaque and certificate by Damian Keegan (Competition Manager), Danny Allen (Rainford High School) and Dianne Murphy (Schools Sports Partnership) who work with the Club to plan and deliver the St Helens Schools Tennis Programme.